The Summit, one of the most unique water conversations in the country, brings together leaders from the private and public sectors across the southeast region to discuss ongoing challenges, innovative approaches and critical solutions to water infrastructure issues facing communities today. 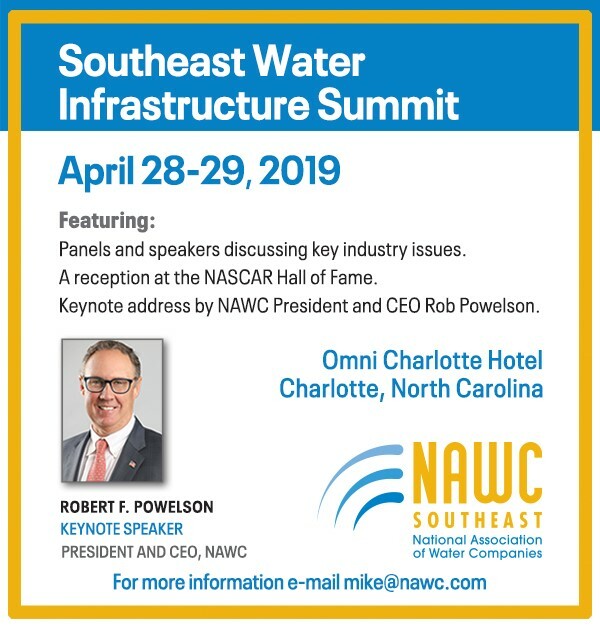 Local, state, regional and national experts will address how to balance the critical need for investments in water and wastewater infrastructure while protecting the environment, customers and businesses.As the largest chapter in the NAWC’s network of ten state chapters, the Southeast chapter seeks to elevate the infrastructure replacement discussion to the regional level at the 2019 Southeast Water Infrastructure Summit. The event, will provide a forum for community water and wastewater systems – private and public – to collaborate on the shared goal of continuing to deliver safe, reliable water and wastewater services to communities. Expert speakers at the Summit will include state regulators, local government officials, engineers and executives from some of the region’s largest private water utilities. This is the only event of its type to address critical challenges for the water sector across the region. We hope to see you there.